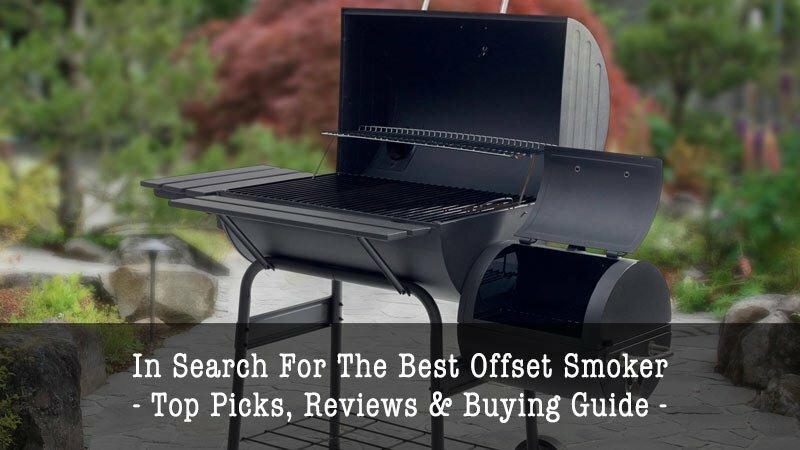 Are you looking for the best offset smoker or smoker and grill combo? At Cooking Detective, we explore the best options, from budget to features. What does an offset smoker need to be truly great? Well, it needs to produce excellent food at a good value. 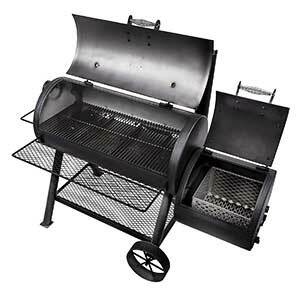 For our top all-around pick, we chose Oklahoma Joe’s Charcoal/LP/Smoker Combo. While it’s not the most affordable option, it is without a doubt the most versatile option. Oklahoma Joe’s Combo can be used for grilling and smoking: it’s really the only thing you need for your outdoor cooking area. If you’re looking for a durable and easy-to-use appliance, this is it: there are multiple vents that can be adjusted for better cooking, as well as multiple temperature gauges and an exceptionally large capacity. You can use one side of the Oklahoma Joe’s Combo or you can use all sides at once, and you can control each of them separately to get the best results each time. Usually choosing the best offset smoker is a matter of knowing what type of smoking you’re going to be doing. Smokers are extremely versatile: there are a lot of different options out there, depending on the amount of space you have, your budget and more. Here are some of the most important considerations when choosing an offset smoker. Some smokers may be able to smoke a few pounds of meat: other smokers can smoke up to 100 pounds of meat. Depending on the capacity that you need, this may actually be the most important factor in your decision. High capacity smokers are going to be more expensive, but often more durable, as they need to retain heat over a larger surface. Smaller capacity smokers often make it easier to cook consistently because it’s easier to manage and monitor their temperature, but understandably it may not provide enough capacity for some events. Heavy duty, all weather appliances are the most desirable when looking for appliances that are going to be kept outside. The most affordable smokers may not necessarily be the most durable, while the most durable ones may be a little more expensive. On the other hand, more portable devices may not be as high quality, but they may need to be lightweight to be brought to areas such as camp sites and picnics. Charcoal, electric and propane appliances are all available, depending on the type of smoking that you want to do. In general, charcoal and wood are considered to be flavorful options, with wood being the most favorable. While propane appliances tend to be reliable and consistent, they also mean that you need to have propane around. Affordability is always a consideration when it comes to smokers, especially because they have such a wide spectrum. There are smokers that are under $100 and are designed to be portable and easy to use, while there are other smokers that can be upwards of $1,000 dollars and be high quantity and nearly commercial grade. Some smokers are just smokers. Other smokers are also grills. If you’re looking for a single, all-in-one appliance for your outdoor cooking area, you may want a combination. If you’re more interested in getting the best individual appliance for each task, you may want a dedicated smoker that only smokes. Some of the best offset smokers have special features, such as the ability to connect them to larger grills, as well as the ability to have their temperature automatically, digitally managed. These features make the smoker easier to use. Of course, with the number of options available, it can be a little confusing to figure out what the best smoker for you is. Consequently, we’ve created an in-depth list of the best smokers, including the top budget option and the top portable option. You can check out our list to help you make the right decision. Offset Smoker vs Pellet Smoker : Which Should You Buy? What’s the difference between offset smoking and pellet smoking, and which option is right for you? Ecternally, offset smokers and pellet smokers are going to seem very similar. Offset smokers are very simple. They have a firebox that’s loaded with charcoal or wood. This produces heat. The heat is then moved into a main area, which contains food that needs to be smoked. 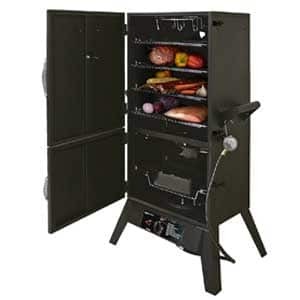 An offset smoker can be horizontal, with a firebox to the side. It can also be vertical, with the firebox at the bottom. Pellet smokers are a little more complex. Mechanically, they function almost the same as an offset smoker. However, instead of having to hand feed the pellets, the pellet smoker automatically feeds the pellets in as needed. This creates a more consistent cooking experience. A pellet smoker is going to be a little more expensive than an offset smoker, but it means that you can “set and forget” your smoking experience. Both of them should provide an even cook at the end, but some feel that pellet smokers don’t have as much of a flavor as offset smokers in the finalized product. You can try both options to see which tastes best to you. What You Will Love: What makes Oklahoma Joe’s Charcoal Smoker so special? It’s every type of grill in one. An electric grill, gas grill and smoker combined, the Oklahoma Joe’s combo has a total of 48,000 BTUs of power, split between gas grilling and charcoal. You can choose which side you want to use (or use both), to grill and smoke to your heart’s content. We love the fact that you only need a single device to handle all of this. 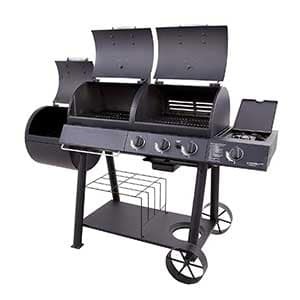 This all-around charcoal/LP/smoker combo features two separate sides, one of which has 36,000 BTUs of gas grilling power, while the other has 12,000 BTUs of charcoal. You have the option of using either side or both sides, depending on the type of cooking you want to do. You can grill or smoke with Oklahoma Joe’s, which has 310 square inches of cooking in the smoker side and 1,060 total square inches of cooking space. If you’re cooking for large groups of people, or you just want versatility, Oklahoma Joe’s is the best. You don’t need multiple appliances and tools if you have a single Oklahoma Joe’s: you’ve already got everything you need in a single contained combo. Oklahoma Joe’s includes both gas and electric ignition and it has an extremely durable build. Weighing in at 204 pounds, it’s a heavy duty machine that will last a long time to come. Oklahoma Joe’s prides itself on durable, long-lasting smokers and grills, making it one of the best brands for this type of cooking technology. A few features of the Oklahoma Joe’s combo includes multiple dampers which can provide for better heat control, a special storage shelf that makes it easier to organize your outdoor cooking and lid-mounted temperature gauges, which make it easy to cook your food and improve your food safety. Special cool touch handles also make the smoker combo easy to manipulate. If you’re only going to purchase a single grill product, you’re best off purchasing Oklahoma Joe’s. You’ll only need one grill instead of three, with all the lessened maintenance and cleaning that implies. For the features available, the Oklahoma Joe’s combo is extremely affordable, and it takes up far less space than having a number of other grill products. What You Will Love: If you’re looking for the best value in a charcoal offset smoker, choose the Dyna-Glo. The Dyna-Glo Charcoal Offset Smoker has some superb features: it can cook up to 100 pounds of food across six adjustable trays, has a durable all-weather exterior and retains heat throughout its heavy duty build. We love the price of this offset smoker, in addition to its attractive appearance: it’s not just an appliance, it’s decor. With 15,000 BTUs and nearly 800 square inches of smoking area, the Dyna-Glo can handle up to 100 pounds of food at once. This offset smoker has a heavy duty, porcelain box for wood chips, and two separate doors makes it easy to access the smoking section of the smoker without losing any heat from the chips. Altogether, the Dyna-Glo provides by far the best value: it’s an incredibly sturdy, long-lasting device, available at an extremely low cost. Those aren’t the only features of the Dyna-Glo Charcoal Offset Smoker. The Dyna-Glo features an attractive design, wide set and nearly impossible to tip over. It isn’t just an appliance: it can be used as decor for an outdoor living space. As an offset smoker, it keeps the food away from the heat source, thereby creating a smooth cook throughout. Inside of the Dyna-Glo are a total of six cooking grates, which can be adjusted based on height depending on individual cooking needs. The heavy duty build of the Dyna-Glo means that it retains heat extraordinarily effectively, improving upon the efficiency of the cooking and making wood chips and briquettes last longer. The Dyna-Glo provides professional-grade smoking without any additional hook ups or complications, and it is truly a “set and forget” product: load it up with meat and other smoked foods, and you can come back later to the perfect meal. You can check the temperature at any time with the external thermometer, while adjusting the flue based on the temperature and taste you want. Once you’re done, it’s easy to clean: just clear out the grates and empty the ash pan. What You Will Love: With a total of 3.4 cubic feet of space, this propane offset smoker makes it easy to get into gas-powered smoking. The Smoke Hollow 2-Door Propane Gas Smoker has a number of options open to fine-tune temperature control, ranging from multiple vents and propane-based controls. What we really love about the Smoke Hollow is its small, attractive format, large amount of power and the ability to easily control the heat. At 20,000 BTUs of gas power, the Smoke Hollow 2-Door Propane Gas Smoker is ideal for those who want to cook large quantities of food in the comfort of their own backyard. This propane gas smoker is solidly built and takes up very little space, making it an excellent addition to most outdoor living spaces and cooking spaces. An easy-to-read external temperature gauge is placed in the center of the propane gas smoker’s top door, which allows direct and easy access to the food that’s being smoked. Underneath the main door is a secondary door, which can be used to access wood chips and other fuels. There are a total of four plates that can be used to cook food, in addition to an available sausage hanger. The Smoke Hollow is an excellent choice for those who want to realy fine-tune their control levels, as the propane controls let you control the heat from hot to hotter. Not only is this a fantastic entry-level smoker, but it’s got enough room for even the most experienced of outdoor cook. The only downside is that, as a propane gas smoker, it does require that you have available fuel. Both upper vents and lower vents make it easier for you to optimize your temperature, whether you’re interested in slow smoking at low heat or fast cooking at high heat. It’s also very easy to start the Smoke Hollow smoker: you just need to push a single button at the machine will ignite. There are few small, attractive propane smokers out here that are as easy to use and easy to clean. What You Will Love: There’s nothing like the taste of wood when it comes to smoking. The Trager Grills Lil Elite 22 is a small, compact wood grill and smoker, which can be used to cook virtually anything. With a wood pellet filled hopper and a digital temperature control, the Traeger Grill can maintain the same heat for long periods of time. We love how versatile this smoker and grill is: you can use it for anything. An incredibly versatile grill, the Traeger is able to be used for everything: smoking, braising and baking. 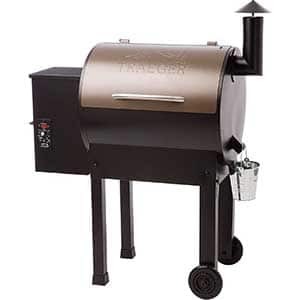 The Traeger Grills Wood Pellet Grill and Smoker is an all-in-one offset smoker that gives you everything that you need, including cooking with wood rather than gas or electric power. Wood pellets are the perfect way to get a consistent smoke and high heat. That’s not all that the Traeger Grill can do. It has an attractive, rounded construction, with an easy to open lid that creates a tight, solid heat-retaining seal. The vent at the top can be adjusted to control the temperature. Wheels at the bottom of the Traeger make it easy to move throughout your backyard grilling space, while the legs increase its security. A digital controller is used to make sure that the Traeger Grill gives an old-time taste with modern levels of convenience. That’s one of the best features of the Traeger Grill: it makes it easy to use, even for things like smoking, which requires that a specific temperature be held for long periods of time. With the digital controller, you’ll be able to avoid any burning or undercooked food. One of the largest issues with wood-fired grills is often that the grill may have an unpredictable or difficult to control temperature. With 418 square feet of space in the interior, the Traeger Grill can cook up to 16 burgers at a time. It’s perfect for the backyard cook, those who love to have backyard BBQs or those who are cooking speceifically for their family. The pellet hopper is able to hold up to 18 pounds of wood pellets. You can cook anything you want in this backyard cooker, though it is a little more expensive than some of the simpler models. What You Will Love: An attractive and affordable smoker by the popular brand Weber, the Smokey Mountain Cooker is a compact device that makes for fast, easy no fuss smoking. We love how small and stylish the Weber Smokey is, in addition to how easy it is to immediately cook small amounts of meat. If you want to cook meals for your family or for small parties, this vertical offset smoker is ideal. With a capsulized, almost space age design, the Weber Smokey Mountain Cooker is a compact vertical offset smoker with style to spare. An affordable option, the Smokey Mountain is perfect for those who want to cook small quantities of food at once. The Smokey Mountain has room for two large items at once, and its porcelain-enameled surface will last an exceptionally long time. 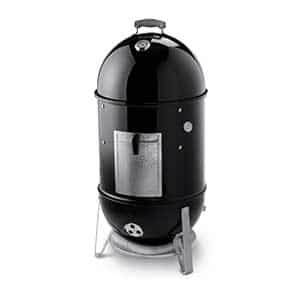 The exterior of this offset smoker has multiple vents which can be used to control the cooking, and the product itself is made out of a durable, thick material that will retain temperature for a long time. An efficient, modern design, the Weber Smokey Mountain is ideal for households that do a lot of day-to-day grilling and don’t want to have to fire up a huge smoker or a grill. The Weber Smokey Mountain is a single use device, which is intended mostly for smoking rather than high heat grilling. Consequently it’s not the best choice for those who want an all-around product. Nevertheless, it’s really a focused, compact, and affordable device that is perfect for those who want to smoke and just to smoke. It’s easy to use and won’t take up a lot of space. Weber is a brand that many people trust when it comes to grills and smokers, making the Smokey Mountain a good choice for beginners and for those who want a solid product that’s going to last them a long time to come. In addition to the vents, the Smokey Mountain also has a gauge at the very top, to make it easy to see what the temperature is at any given time. What You Will Love: Go camping in style with the Char-Griller Table Top Charcoal Grill, a grill and smoker that can also be used in conjunction with larger grills. We love the Char-Griller’s simple and compact design, which nevertheless includes multiple adjustable vents and is very easy to clean. If you want 250 square inches of grilling space in a portable format, the Char-Griller Table Top is the best available option. A small, table top grill, the Char-Griller is an affordable option that has a lot to offer in terms of simplicity. At both sides of the Char-Griller is an adjustable vent, to make it easy to control the temperature. The Char-Griller further has an easy-to-grab wood handle, which doesn’t retain heat and makes it easy to open the Char-Griller at any time. This special grill is the perfect solution if you like to take your grill and go. The Char-Griller can be taken with you when you camp or when you go for a picnic. Despite that, there’s 250 square inches of grilling space: enough for a sizable meal. The heavy steal of the Char-Griller retains a lot of heat, while still making it manageable and easy to carry. If you already have Texas Style products, you’re in for a treat: the Char-Griller can be attached to another Texas Style grill for additional grilling space or for horizontal smoking. For cleaning, there’s an easy to empty ash pan… and the gas iron grill is both durable and easy to manage. If you need a single, small grilling product that you can take with you, the Char-Griller is the perfect solution. With multiple uses, easy heat control and easy clean up, the Char-Griller is a versatile grill that also performs well as an entry-level device for those who are interested in getting into grilling. While also being an affordable option, this Char-Griller has a lot to offer in terms of charcoal-powered grills. What You Will Love: Oklahoma Joe’s Longhorn is a reverse flow offset smoker, with a number of dampeners used to adjust the heat, and baffles that allow heat and smoke to flow through the entirety of the device. 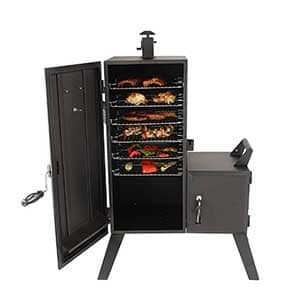 This reverse flow smoker produces evenly cooked, flavorful products, with a large cooking surface and easy-to-clean implements. We love the design of this smoker, which comes with plenty of storage and a durable exterior. This exceptional reverse flow offset smoker comes complete with a total of 1,060 square inches of cooking surface: more than enough for even the biggest of BBQs. This reverse flow smoker has both a main chamber and a horizontal firebox chamber, with a series of baffles that are designed to route smoke effectively throughout the unit. This provides a more even, more flavorful cook. There are a total of four grates in the Oklahoma Joe’s reverse flow smoker, which can be adjusted or removed depending on the size and configuration of what’s being cooked. The fire chamber is designed for ash to be easily removed, and the entirety of the unit is very easy to clean. The grates themselves are coated with porcelain to make them easier to use and wipe off after cooking. A gauge at the very top of this large offset smoker makes it easy to check on the temperature, while multiple dampeners can be adjusted depending on the temperature needs. The product itself is extremely durable, with an all-weather finish and multiple shelves that can be used for storage. Wheels at the bottom of the smoker make it easy to move. 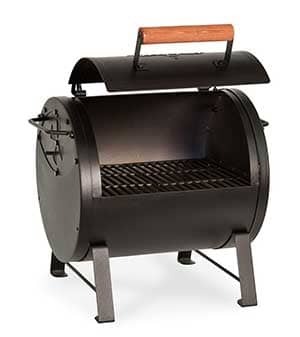 Compared to some other units, this offset smoker is a little more expensive: however, it makes up for the cost in price. If you’re interested in the benefits of a reverse flow smoker and you want a large, easy-to-use device, the Oklahoma Joe’s reverse flow smoker is ideal. Are you ready to purchase a smoker? Whether you’re interested in vertical offset, horizontal offset or reverse flow smoking, our list can help you make the right decision. To learn more about all types of kitchen appliances and cooking tools, follow the Cooking Detective.